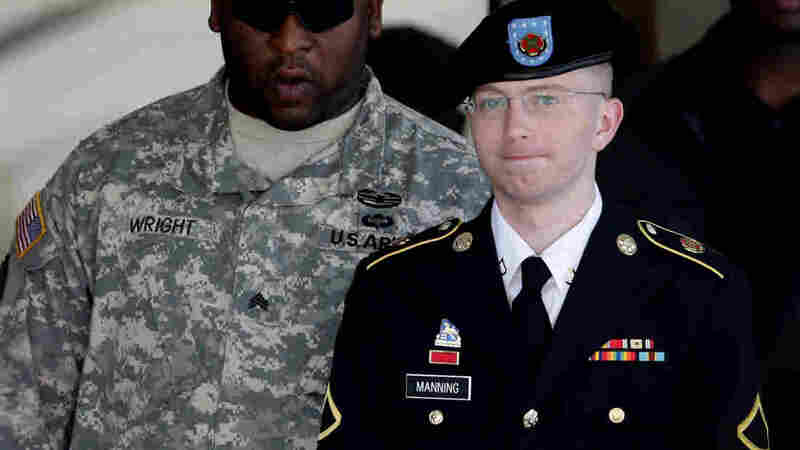 The Bradley Manning Trial: A Short(ish) Guide To Understanding The Case : The Two-Way The case about the largest leak of classified information in U.S. history is bound to be complicated, long-running and often secretive. For the next 12 weeks, a military judge in Fort Meade, Md. will consider the case of Army Pfc. Bradley Manning. It's bound to be a complicated, long-running and often secretive process that kicked off on Monday. Before we get too far into the court-martial, we wanted to put together a shortish guide to bring you up to speed on the trial. Central to this court-martial is the vast trove of government data that Manning handed to the website WikiLeaks. They mark the largest leak of classified information in the history of the United States. It was a video dubbed "Colateral Murder" that first brought attention to Wikileaks in 2010. It showed a 2007 incident in which a U.S. military crew on an Army Apache helicopter shot at Iraqi civilians and a Reuters journalist, after allegedly mistaking them for insurgents. It provided a rare chance to witness an incident of what the military calls collateral damage. The leaks continued, peaking with the release of hundreds of thousands of diplomatic cables, that brought mostly diplomatic headaches for the United States. Some argued that they revealed much more — in some cases the identities of operatives and informants across the world. The government said during the first day of the court-martial that it will present evidence that Osama bin Laden asked for and received some of these cables. The documents are archived here. PBS' Frontline has a quick 10-minute profile of Manning that is worth watching. In short, he is son of an American dad and a British mother who grew up in a small town near Oklahoma City. His relationship with his dad and his stepmother was strained. He joined the Army in 2007 seeking some structure and direction for his life. He became an intelligence analyst for the Army and received access to classified information. Manning was arrested in May of 2010 over the leaks. Since then, he has been held by the U.S. military. Since his arrest, we have not heard much from Manning. His most significant statement came when a judge was considering throwing out the case against him because of the way the U.S. government treated him. As NPR's Carrie Johnson reported in November of 2012, it was highly unusual for a court-martial to be delayed for more than three years. Not only that but at one point, Manning was kept in complete isolation and in some instances forced to sleep naked and without a blanket. Manning's defense attorney David Coombs, who himself has been pretty quiet, said that Manning's treatment at the Marine Corps Base in Quantico, Va., will "forever be etched, I believe, in our nation's history as a disgraceful moment in time." The military judge ultimately refused to drop the charges against Manning. But the proceedings allowed him to plead guilty to lesser charges and make his first public statements. Manning read from a 35-page statement. He explained that he thought the battle field reports were not considered sensitive in the military and that he leaked the diplomatic cables, hoping it would lead to a more open diplomacy. "I believed that these cables would not damage the United States," Manning said. "However, I believed these cables would be embarrassing. The government decided to go through with the more serious charges against Manning. As NPR's Carrie Johnson reported earlier this month, Manning is facing charges "including violations of the Espionage Act and aiding the enemy, which carries a possible life sentence." Carrie adds that during the 12-week trial, the government will have to prove "Manning had reason to believe the leaks would hurt national security." Court House News Service reports that on the aiding the enemy charge, the government has to prove that Manning leaked the information with that intent in mind. We will post on major developments in the case, but several reporters covering the trial have been tweeting live updates. Ed Pilkington is covering it for The Guardian; Alexa O'Brien is covering it for The Huffington Post, and Kevin Gosztola is covering it for the liberal website FireDogLake.